With regard to the first part of the [Alice] framework, we agree with the Examiner that the claims are directed to a method of organizing human activities and, in particular, to the abstract idea of creating a priority order of a list of rules and presenting a graphic user interface to edit the list. (See Answer 3, see also Claim 1.) “The ‘abstract idea’ step of the inquiry calls upon us to look at the ‘focus of the claimed advance over the prior art’ to determine if the claim’s ‘character as a whole’ is directed to excluded subject matter.” Affinity Labs of Texas, LLC v. DIRECTV, LLC, 838 F.3d 1253, 1257 (Fed. Cir. 2016). 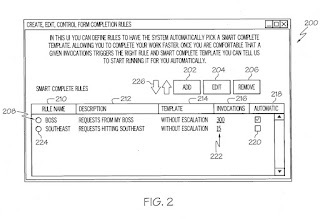 In this case, the Specification discloses that the invention is directed to “processes that may involve user or human interaction, and more particularly to a method and system to automate a user out of a process flow.” (Spec. 11.) And claim 1, as a representative claim, recites “determining ... if a process template . . . exists,” determining ... if a rule exists for automatic completion ... of the process template,” “at least partially completing ... the process template,” and presenting a GUI “for creating, editing, and controlling activation of the list of rules.” (Claim 1.) Courts have treated claims directed to similar subject matter as directed to an abstract idea. See Apple, Inc. v. Ameranth, Inc., 842 F.3d 1229, 1237, 1240-41 (Fed. Cir. 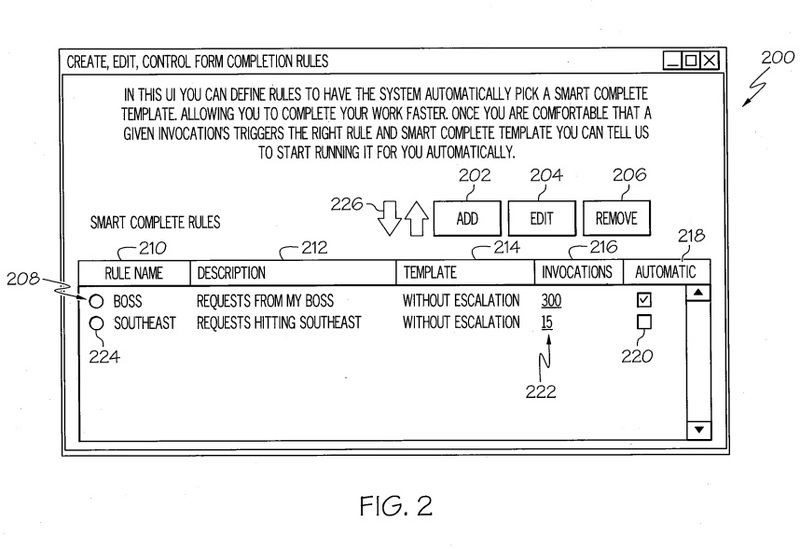 2016) (providing a GUI interface to generate menus, i.e., “list[s] of options available to a user displayable on a computer,” with certain functions); see also Intellectual Ventures I LLC v. Capital One Bank (USA), 792 F.3d 1363, 1369—70 (Fed. Cir. 2015) (providing an interactive interface to the user). Additionally, “the claims are not directed to a specific improvement in the way computers operate. Cf. Enfish [LLC v. Microsoft Corp., 822 F.3d 1327, 1335-36 (Fed. Cir. 2016)].” Apple, Inc., 842 F.3d at 1241. Therefore, we are not persuaded that these claims are not directed to an abstract idea.